The RGreenway application, designed for smartphones, functions as a guide to the Raleigh Greenway systems. Long-term, the application is designed to make the 3800 acre 115 mile Raleigh Greenway system an integrated park. No other City or community of cities has invested as much as Raleigh and the Triangle in a system like ours. 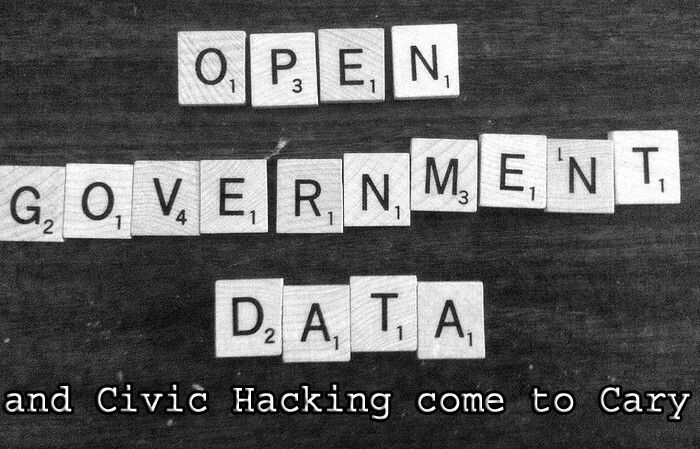 Few have committed themselves to the principle of open data like Raleigh has. Together this presents an opportunity to create America’s Smartest Park. So, right now – it is only accessing Raleigh data – how about expanding it to include Cary, and the rest of the Triangle? Wouldn’t that be cool? Let’s see how Open Data can be used to help citizens better connect with Town Hall, find information about Parks, Bus schedules, and more. What if we had a Parks and Rec app that would list ALL of the parks, playgrounds, dog parks, community center, public restrooms and other interesting locations (like the Cary Arts Center and Historic landmarks) around Town. We could enable location-based technology so that the app could tell you about interesting sites, greenways, paths or activities near you. 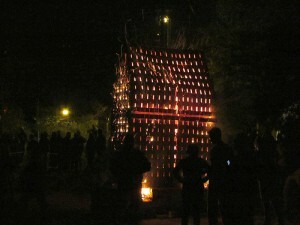 In fact, just the other day I was speaking with Town Staff about the Fire Sculpture that is currently across from the Cary Arts Center. Wouldn’t it be awesome if you could walk up to our Fire Sculpture today, and see a placard that explained the process that was used in its creation? (If you were there that day, it was truly magical. It can be hard to imagine what it was like that week, by just looking at the ceramic piece now. ) But, it would really hel put some additional context around the experience by having a placard near the sculpture that described the creation steps, along with this QR code, that would launch the video actually showing you the process. And finally – how about an app that taps into our C-Tran bus schedules. TransLoc has a few apps available for the Triangle Transit Authority today – but they don’t yet include C-Tran. (I hear it’s coming soon!) It will be great when a C-Tran app will show you where the C-Tran buses are, the bus stops, schedules, and real-time commuting information. That’s data that is open, and could be made available to the public. As you may remember, the Cary Technology Task Force was created last year by Town Council, and was tasked with taking a look at how to leverage and improve technology services to citizens. They looked at everything from our Town website, to social media, mobile applications, Open Data, how to engage citizens, as well as how to leverage technology to enhance economic development (and more). Pardon me while I gush about these folks. I am truly honored that these people gave of their time, talents and energy. They brought more than their technology expertise, they brought a fresh perspective, a child-like inquisitiveness and curiosity, and a passion for excellence that so many of our Town boards and commissions have. We owe them all a huge debt of gratitude. If you see the following folks, please thank them! And of course, I would be remiss if I didn’t thank all of the Town Staff who kept up with this group – they worked long, long hours, and made this effort a true team success. 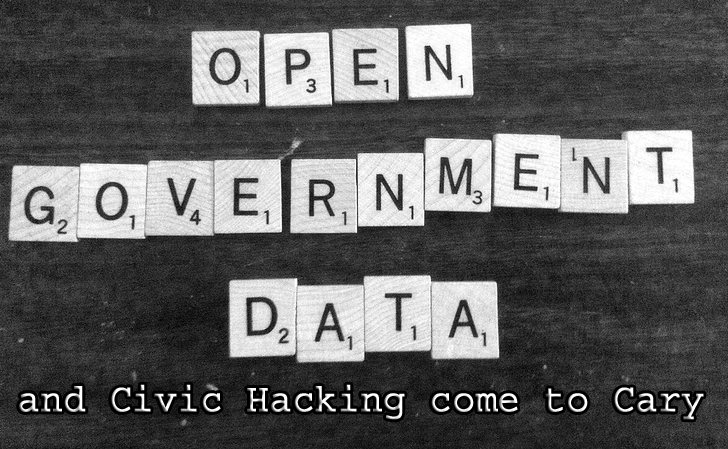 Getting back to Open Data. Open Data is just one of their many recommendations and the impetus for submitting an Open Data Day Resolution. This is just the FIRST step in a set of recommendations that came from the Technology Task Force – but it’s also a VITAL step in taking Cary to the next phase of our technology innovation. This resolution also supports several upcoming events, as well. 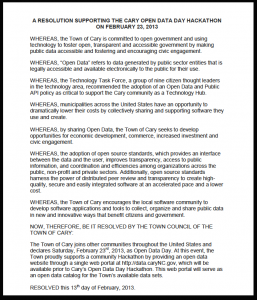 The folks from the TTF were so energized that they set up Cary’s Open Data Day – scheduled for this Saturday, February 23rd. Feb. 23 is International Open Data Day – when people from around the world will gather together “to write applications, liberate data, create visualizations and publish analyses using open public data,” according to opendataday.org. The event is sold out – but it’s just the first step in our journey. So if you are interested and didn’t get a seat, trust me, we will have more ways for you to engage. In fact, check out the TriangleWiki – and share your knowledge of the Triangle , it’s a great way to get involved with the community. 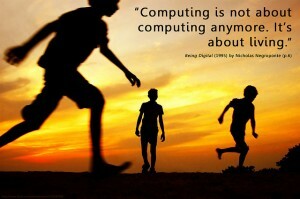 Thanks for letting me “technology ramble” for awhile – hope to see you on Saturday! Thanks for your enthusiastic support of the Technology initiatives in the Town. 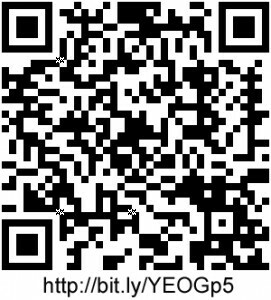 Thanks also for using best practices for your use of the QR code in the blog. Cary Open Data Day is just the beginning of something new. Yeah, sorry about that. Apparently the Webmaster at the Town was out sick but it should be back up and available today. Yay – the site works now. What’s the process for requesting new data sets? I’m interested in development data – plan submissions, approved plans, etc. Currently I have to gather that information manually from various town web pages. Couldn’t have done any of it without you, Lori. Thanks for the leadership. This year: csv. Next year: streaming data.